Orange chicken is a dish made out of deep fried battered chicken pieces dressed with savoury sweet and sometimes spicy orange sauce. This dish has its Chinese roots which came from an original recipe from the Hunan province, while its predecessor was Chinese this dish is totally American. If we are to look closely at its recipe it closely resembles lemon chicken as well as General Tso’s chicken hence it is often found as a variation of both. 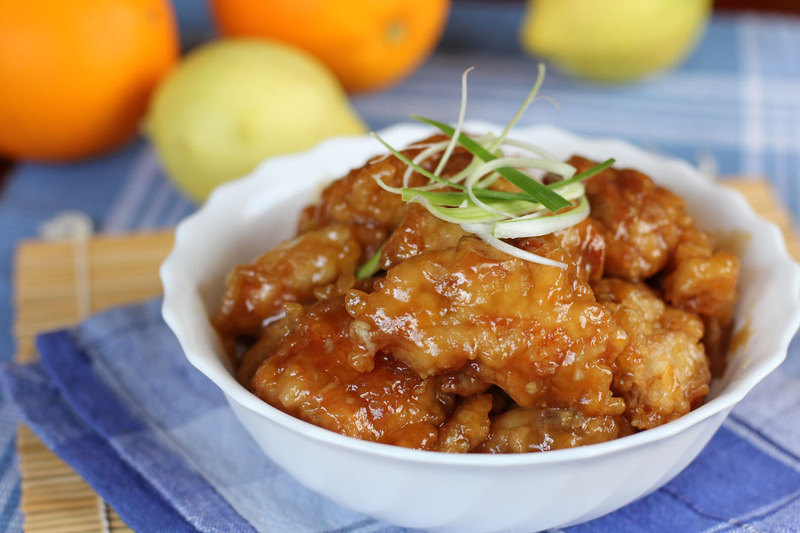 The Orange chicken’s traditional recipe calls for dried orange or tangerine peel where it is well used in traditional Chinese medicine but due present recipes are simplified and fresh peel is often used nowadays. Usually this dish tends to be super sweet, most of the recipes I had seen online calls for cups of sugar for my version we will use way much less of that but it will still have the same fresh sweet taste. A really nice dish to pair with freshly steamed rice and some stir fried or even blanched vegetables. Combine all orange sauce together except salt and white pepper, set aside. Mix together all chicken ingredients apart from chicken and oil. Once even in consistency place chicken meat into batter, set aside. Heat up a wok with enough cooking oil for deep frying, once hot enough deep fry chicken pieces adding one piece at a time. Do not overcrowd, once they turn golden brown and crispy remove from wok then transfer into a plate lined with paper towels. Prepare another wok, add oil then sauté garlic and ginger. Add chilli powder, chicken and orange zest. Quickly stir fry then add the orange sauce mixture. Cook until sauce thickens. Season with salt and white pepper, place in serving plates then garnish with spring onions. Serve. I call this “tacky Chinese” but I LOOOOVE it Ray ! 🙂 It absolutely reminds me of lemon chicken but I think the orange would be delicious. Looks delicious. American Chinese it is, but my boys love it so this would be a winner in our home. But only 500 grams of chicken… I have my hungry boys will need double or quadruple your recipe. Love that photo as well… I think your photography just keeps getting better. It may not be authentic Chinese but it sounds great. I like that you made it less sweet. Raymund: This orange chicken looks amazing! The sauce is so shiny that made me want to eat the whole bowl of it. Great picture, man! I hope you have had a great Easter! I love orange chicken, though I don’t eat it often because of the deep frying. I’m thinking I can use your sauce for grilled chicken thighs and be quite content — thanks! I’ll take mine spicy please 🙂 I like that you reduced the sugar, I often don’t order it because it’s too sweet. I can see this being an awesome sauce for some crispy baked chicken. This looks like a nice variation of sweet and sour pork. That sticky sauce looks very inviting. I am glad you used chicken thighs. Thighs > breast! What a great and easy recipe to make instead of buying take-out! It’s funny, isn’t it? Despite all the quests for “authentic,” sometimes the bastardized versions just hit the spot. Looks delicious. 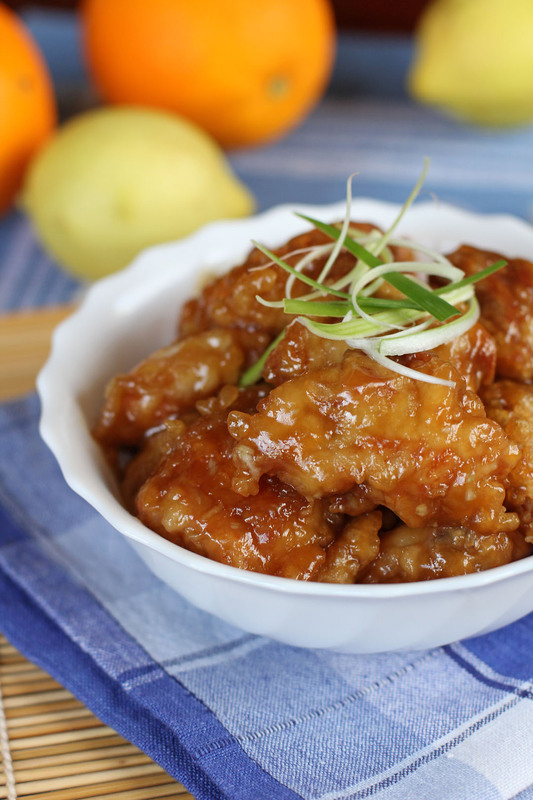 Orange Chicken is one of my husband’s favorite Chinese dishes. I’m going to bookmark this recipe! Thanks Raymund! Oh my! THis is my kind of comfort food! !